Protests have been part of our history and all cultures of the world for the longest. People have protested all sorts of things, from war to poverty to women’s rights and animal rights. But how useful is it to even protest? With this article, I am possibly bringing a controversial take on the effectiveness of protests but I need to make a point here. The need to protest is something I completely understand. I did protest in the past, against wars, for immigrant rights, against fur and animal cruelty. Then I came to realize that it was a waste of my time. The reason for this is that it has little educational value. During the Vietnam War, thousands of people were drafted against their will and even though there were a lot of protests, the war was ended because a strong minority of people were against the draft and refused to go to war. When Bush decided on the war in Iraq, there was no draft forcing some of us to go to war. War is now a voluntary venture. If you decide to put a uniform on, you are for war, whether you think you have a valid reason or not. The decision to start the Iraq war prompted the largest peaceful protest in human history, with millions of people all over the world peacefully protesting against it. Did it stop the war? Well we know the answer to that one. But why not? Let’s look at how society functions and for that matter it applies to animal rights as well. Most people are cogs in a machine. They don’t function consciously. There is so much going on in their daily routine that they can’t see beyond what’s going on in their lives. No one is making a case to them that there is value in changing a few things in their lives and opening their minds to a different way of thinking. There are however a lot of groups out there to tell them to change their light bulbs, change their cars and buy so-called “free range” eggs, that’s about it. Where is the profound shift? Telling someone to change light bulbs or buying “free range” doesn’t create a meaningful or profound shift in the person’s belief system; it keeps the status quo in place. However, challenging peoples’ deepest held beliefs in a peaceful and non-preaching way forces them to think (maybe for the first time in their lives). People are made to believe in myths, whether these myths are about what’s good for their country or what’s important in their daily lives. Societies are built on conditioning and false beliefs to which people are held hostage to. All of this is controlled by a tiny elite who has all the financial power to keep the status quo going and no incentive to change in order to keep said power in place. The Iraq war happened because some of us put on a uniform and were ok going to war, therefore feeding our masters. Most people are not even aware that they are being controlled and manipulated against their own interests. Can talking to people possibly change them? Yes. Will it change a lot of people? That will depend on our effectiveness as speakers and how we make our case. But if we are ourselves still part of the general conditioning, we need to change first so we don’t become the blind leading the blind. It is the same in the animal rights movement. We protest but we keep buying from corporations, McDonald or Wal-Mart types corporations as well as animal type corporations (read the large animal “rights” organization). The latter are telling us that protesting is good and that giving them money is good because it will make a difference to the animals just like we believe that shopping at Wal-Mart is good for us or that sending our sons and daughters to war is good for our country. In all cases, this is delusional. We are still manipulated and brainwashed. If protests worked, they would have stopped most wars and killed the animal industries a long time ago. But they simply don’t because they do not change people from the inside and deprogram or change their habits. Protests may get others to think but there is usually little education done. Protests usually attack the institutions but they do not change the ones who feed these institutions. As long as you have soldiers, you will have wars. As long as you have people who believe that a piece of land is more important than your neighbor’s well being, you have wars. As long as you believe that your religious beliefs matter, you have wars. As long as people eat animals, you will have starvation and therefore wars. Violence feeds violence and ignorance keeps people enslaved and pawns to the elites who are the ones who keep profiting. If you believe all the above doesn’t apply to you, you are even more brainwashed than you think. As long as you have people spending money at McDonald’s or Wal-Mart you have corporate masters who buy governments. As long as you don’t create peaceful community education, you won’t change how people think and show them how to stop feeding the system which enslaves them and other beings. The only changes possible are those which address the roots of our problems and not its symptoms. What can be done? So far the Peace Movement has not made the connection with the Vegan Movement and recognized that they are part of the same fight. The first step is for the peace movement to connect ALL the dots. You can’t have peace in the world if you have violence on your plate three times a day. How do you expect to feed the starving when you munch on a cow’s corpse for lunch and dinner? Your meat is directly linked to starvation in the world as most of the grain (which could feed people) is fed to cattles (up to 80% of the US grain currently). Your meat is also directly linked to environmental devastation as the Rainforest is currently torn down for cattle grazing and feed for bovine slaves. Animal “foods” are behind most of the soil erosion and water and air pollution of the word. Don’t believe me; check what the United Nations’ report “Livestock Long Shadow” and the WorldWatch Institute say about this. If you care about the environment and desire peace, you have to change your lifestyle completely. Your health is directly linked to what you eat. When you eat that steak today, think about what it does to your body and how this benefits big pharma and their drug industry. You directly contribute to a disease care system which keeps you drugged and docile. Second, people who want peace (and are vegan) need to truly educate others as to the reasons why they should do everything in their power to starve the system. Once again it is a matter of individual choices. If you pretend to be for peace but you are ok with your son taking on the uniform to become cannon fodder for the rich, you are living a dream. If you are ok with feeding the system by shopping at Wal-Mart, you are feeding those who profit from it, the ones at the very top or the 1% as we call them. You are not a human being anymore, you are just a consumer. Why do you think Bush said to people to go shop after 9/11? Because he knew that people’s habit of consuming would dumb them down and the power elites could do whatever they want. If you have a dumbed down and ignorant citizenry, it is easy to dupe them and do whatever you want for profit. The Peace movement just like the Animal Rights movement is somehow cowardly when it comes to truly educating people. The large animal “rights” organizations waste millions of dollars on managing exploitation. In the 19th century, if abolitionists had wasted their time on regulating exploitation of slaves, we would still have institutionalized slavery. Slavery, in itself, is unfortunately not gone, but no one (except maybe a few staunch racists out there and giant corporations who profit from slave labor) would agree that it is ok to enslave other humans. If instead of protesting, we had tables everywhere in the country (and possibly the world) on peaceful vegan education and how to be true citizens (as opposed to consumers), we could educate thousands of people. And better yet, educating people on how to be true earthlings would be even more empowering than the idea of nationalist citizenry which just continues to reinforce separatism among people and other beings of this planet. Maybe you will perceive me as fantasist and unrealistic. Possibly. However, I have never seen any real effectiveness in protests, except as a good way to vent our frustrations. Tomorrow, we can all have a town hall and decide to band together to provide solar panels to our communities to reduce the demand for fossil fuels. Tomorrow we can have a town hall and explain to people why their demand for flesh is starving others and destroying the environment, their health and the lives of non-human victims uselessly. Instead of blindly following the so-called non-profits, we can have groups of people setting up educational workshops. Why don’t we do this? Because of the constant brainwashing that our institutions and the so-called peace and animal rights organizations impose upon us because we let them. There is no profit in Vegan/Peace education. But there is a lot of money to be made in single campaign issues for either humans or non-humans. We will never change the system by protesting the institutional abusers (of humans and non-human animals) if we don’t eliminate demand for everything which oppresses us. But we have to become conscious of our own oppression and conditioning. We will however make changes when all of us finally decide to work together and peacefully educate others on how to de-condition and deprogram each others. Then and only then can we hope for a better world. Peaceful Vegan education is the key, so go out there and talk to people. © copyright May 2013. All rights reserved. No printing without authorization. Bob Woodward is almost a legend in journalism nowadays. We all know his work with Carl Bernstein during the Watergate scandal involving President Nixon. I had to get this book on the Bush Administration. I must confess not having read the previous two parts of « Bush at War » but I couldn’t resist Part III. Reading this book was like getting a report on the administration. Bob Woodward interviewed many people including President Bush and Don Rumsfeld but he also had access to a large number of archives and official memos and notes from inside the administration. Which makes this book all the more frightening in its description of the Bush Administration. From the days leading to 9/11 and the war in Iraq to the current (late 2006) status of the insurgency, this book describes it all. It feels like reading a fiction. Unfortunately, it is not one. 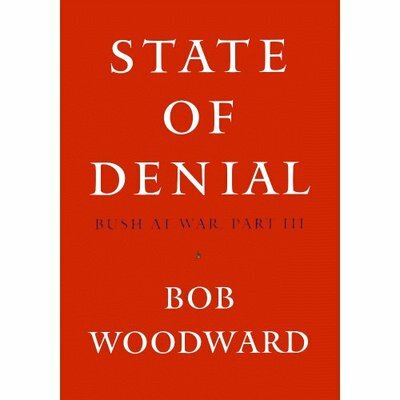 Bob Woodward as is the reader reading his accounts is appalled at the total incompetence of our leaders where it’s from the decision made at the White House and the Pentagon to Paul Bremer while presiding for one year in Iraq. At the same time, it shows clearly the constant state of denial of every « upbeat » speeches Bush makes and how good the administration is at piling lies. If you want an inside look at the administration and its Iraq policies, this book is for you. This is serious work done by a serious journalist. I couldn’t ask more from Bob Woodward.